This is a birds photo called "baby housemartins poking heads out of nest". 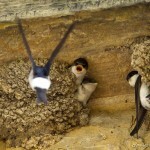 It is featured in the image gallery called "Family of House Martins Nesting". This gallery and many others can be found in the Birds section(s) of the Photorasa website. Open the image below to view a sharper and higher resolution version in a window. The photo can be saved to your digital device by clicking on the download button below. 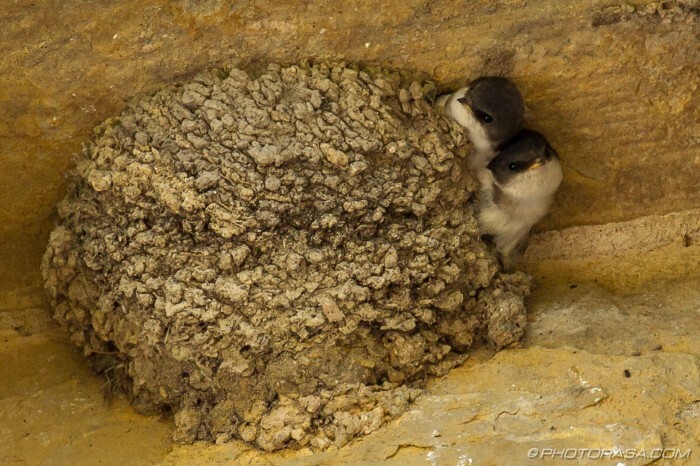 A higher resolution image for "baby housemartins poking heads out of nest" minus the watermark is available upon request. A collection of bird photos and picture galleries from Photorasa articles. All the photos featured are of a high quality hd standard - 1920 x 1080 - featuring high levels of detail. All the photos are taken in the birds' natural environment with no deliberate baiting or set ups. The only concession to this rule are the shots taken in the back gardens of homes where food has been left out. The feeding of birds near human habitations and in urban environments is part of a relationship between human beings and birds that goes back many, many centuries. One can argue strongly that the food available to birds due to the hobby of bird feeding has actually now become part of the bird's natural environment. This food can become essential to many birds' survival in cold weather when other means of getting food from the soil are not available.